As the road to Super Bowl LII rolls on, so does Bullseye’s countdown to Minneapolis. 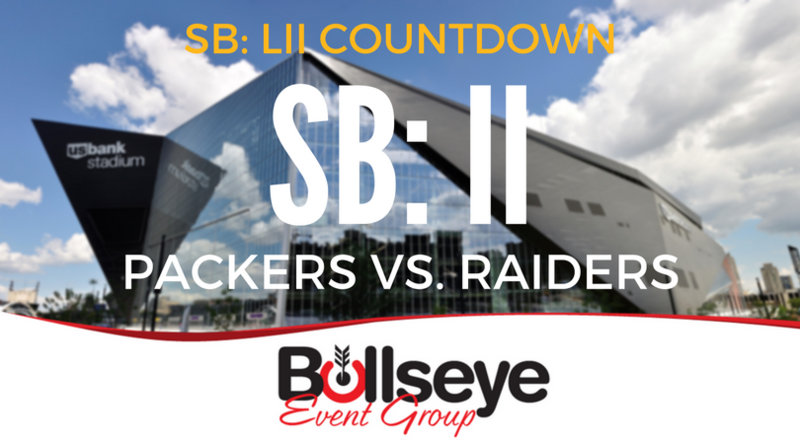 Next up, Super Bowl II: Bart Starr and the Green Bay Packers make their second straight Super Bowl appearance, this time against the Oakland Raiders. The second ever AFL-NFL championship game was held in Miami, Florida on January 14, 1968. Thus far, fans both in attendance at Miami Orange Bowl Stadium and elsewhere were beginning to form the opinion that teams from the NFL were much more talented than the teams on the other side in the AFL. There were a total of 74,546 fans in attendance at Super Bowl II. The Green Bay Packers were facing off in their second straight Super Bowl appearance, this time taking on the vaunted Oakland Raiders. Both reporters and fans alike expected the Packers to dominate the game, and that they did. In fact, the Oakland Raiders were only able to score twice in the entirety of the game. Don Chandler, the Packers kicker, was able to make four field goals and defensive back Herb Adderley added a 60-yard interception return for a touchdown en route to the Packers’ second straight championship, a 33-41 victory over Oakland. Not to be forgotten was Packers quarterback Bart Starr, who not only was the first two-time Super Bowl champion quarterback, but was also named Super Bowl II MVP as well. Just two Super Bowls played, two championships and two Super Bowl MVP awards would help to cement Starr’s status as one of the all-time greats. Get excited for Super Bowl LII in Minneapolis! Book your travel packages today with Bullseye Event Group! Luxurious hotels such as the Hotel Ivy, Radisson Blu, Marriott AC Mall of America and the Marriott Towne Place Suites, a ticket to the 2018 Players Tailgate at the Super Bowl and more. Learn more about Bullseye’s complete Super Bowl LII Travel Packages today!